The Gold Mine: Can Charlotte 49ers fans expect to see a repeat? Ja’Quil Capel, a graduate of West Montgomery High, tied an East-West All-Star Game record for most points and touchdowns scored by an individual, as the East won a dominating victory 35-9 Wednesday night in the annual N.C. Coaches Association football classic. Capel, a 5-foot-11, 175-pound record-setting quarterback for West Montgomery, accounted for four of the East’s five rushing touchdowns on the night. He finished the night with 70 of the East squad’s 282 yards rushing. During his career at West Montgomery, Capel finished with 78 rushing towndowns and 35 passing, totaling 8,582 yards of offense. And perhaps most importantly? 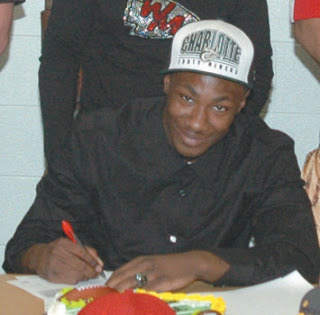 He's going to play college football for the Charlotte 49ers, who field their first team in fall 2013. Capel was one of eight future 49ers taking part in the game. The others: Brandon Banks (High Pont, N.C./Southwest Guilford H.S. ), Jalen Holt (Norwood, N.C./South Stanly H.S. 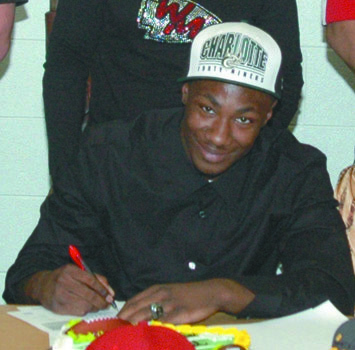 ), Larry Ogunjobi (Greensboro, N.C./Ragsdale H.S. ), Mark Pettit (Greensboro, N.C./Western Guilford) and Mason Sledge (Monroe, N.C./Monroe H.S. ), all played on the West team. In addition to Capel, Terry Caldwell (Wilmington, N.C./John T. Hoggard H.S.) and Will Thomas (Hampstead, N.C./Topsail Senior H.S.) played with the East. Caldwell was named defensive most valuable player in the game. Niners football looking good already!!! There were 3 other future 49ers playing in this game. They will be preferred walk-ons. RB Donjore Gainey who scored the other TD for the East, OL Cody Brown, and WR/K Zachary Lahaie. I could not agree more. ALOT of growing pains. Losses will be piling up soon enough starting with the home opener against Campbell...Bawhahahaha!!! UNCc is still going through with this football experiment? One repeat we are sure to see: People who have no connection to the 49ers or UNCC in general, who lead miserable, empty lives completely bereft of anything positive, who get aroused spewing as much negativity and hate to this city, it's largest university and that university's athletic department as they possibly can, will repeat their hatred on every post of this blog - usually saying the exact same thing every post. Meanwhile, the 49ers will win at least 9 games each of the first 2 years against a creampuff schedule and will march on to FBS and Conference USA - a conference that, now that the 3 best programs have left for other conferences, is so bad that the closest thing to a real football team is in the alleged "university" in Greenville NC. Within 3 years, the 49ers will completely own C-USA. J...Conference USA is a complete joke in football. You are dreaming if you think UNCC will win more than 3 games in the first 2 years. The basketball team can barely win that many conference games. Wait and see. Print this off and revisit in 2 years. Bruce is ALWAYS right. Bruce- Charlotte will definitely win many more than 3 games in the first 2 years. I hope you're around after the first half of the first season to eat all of your words. No worries- you can keep pulling for the newest academic joke, that cheating school in Chapel Hill you could never attend- we won't take that away from you. I'll be looking for you to be here when Charlotte's winning games in those first two seasons Bruce. Bruce is a dumb a$$......just sayin. Did you take any of those fake Swahili classes in chapel hill? My guess is that's the only way you would pass ANY college class on any campus. I aint never took no college classes nowhere. Go Heels.